I used to hate (really, hate) powdery perfumes. Now I'm very nearly the opposite: you can take a fragrance that I don't love all that much, give it a nice dusting of powder, and there's a good chance I'll at least like it better. So it goes with Narciso Poudrée, the latest from Narciso Rodriguez, and the latest entry in the current trend of powdered flankers. If they'd dumped a load of powder on Narciso by Narciso Rodriguez, a fragrance I already thought was darned good, I might have been forced to buy it. Instead, they did an Eau de Toilette version that I found distinctly less interesting, and then they dumped a load of power on that. Actually, this one is tweaked a bit from the Eau de Toilette, which was peony and rose (the original was gardenia). This one promises rose and jasmine (and cedar, musk, vetiver), and it is indeed a more concentrated floral experience, one step back from the "generic pink flowers" of the Eau de Toilette. It has a richer woody musky base, and is less overtly clean in general — and we're back, meanwhile, to Eau de Parfum. The raspy top notes of the Eau de Toilette and the original Eau de Parfum are toned down a bit, the fruit is a bit jammier without quite crossing over into fruity floral territory, and the powder, while heavier than in either of the first two entries in the series, is still very much in the modern mode, that is, a dusting of pale, vanilla-tinged creamy cosmetic powder: a light veil, no more. It might be a bit much in August but it's not a heavy perfume once the top notes settle, nor is it overly sweet. The lasting power is pretty good. Verdict: I like Narciso Poudrée. It's well done. 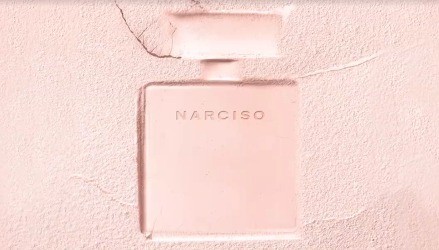 It's easy to wear, probably more so than the original Narciso, and it's got more oomph than the Eau de Toilette, which was a shade too anemic for my taste. Something of a middle ground, then, but it still lacks the quirky / fun edges of the original Narciso, and while I did enjoy wearing it, there are others in this category I like much better (I'd rather have the sadly discontinued Love, Chloé, for instance). If you're a powder fan, or if you still need a go-to light powder, it's certainly worth sampling, and if unlike me you preferred Narciso Eau de Toilette to Narciso Eau de Parfum, I'd say it's a must try. Plus, the color of the bottle cap and the juice is perfect. Narciso Rodriguez Narciso Poudrée is available in 30, 50 and 90 ml Eau de Parfum. I haven’t tried this one, but thought the original one was light and powdery. My favorite powdery perfume is Chanel No. 19 Poudre, but it’s not that liked by perfumistas. The original is lightly powdery, but I wouldn’t have called it light overall. It’s all perspective, of course! And gosh, I thought No. 19 Poudre was widely loved? annemarie, you’ve perfectly summed up my feelings on No 19 Poudre. The opening 15 minutes or so is absolutely gorgeous, but then it fades to the most boring white musk imaginable. Such a wasted opportunity! Which might explain why people hesitate to mention it? I don’t think it has anything to do with the original’s dedicated following, after all, 5 Eau Premiere has tons of fans. But I tend to love powdery – Back to Black, No 5 , Fate, Beloved…Maybe I should give this a try. Admittedly, I’m a sucker for the whole Narciso line. It sounds like this is a must-try for me…powder = yes. For some reason, the colour of this bottle puts me off…I think it reminds me of the despised “flesh” colour in old-school crayons. Maybe it is better live? Oh, that’s too bad. I love the color but totally agree it is the same as flesh-colored crayons. I looooooove powder (save Misia and Iris Poudre, which feels like wearing the outfit of a Jane Austen heroine). China White, Eau Premiere, heck I’m wearing Shalimar parfum right now! I’d definitely like to try this one out. I googled RZ to see what else she’s fronted and surprise! The original Narciso! Ha, she is the powder queen! I won’t say LC is discontinued definitely because it isn’t like I’ve ever verified with Coty, but I’ve heard it is, and it’s no longer listed on their website. Anyway, this is way less hyper-fem than Iris Poudre and/or Misia. Lizzy, which Tom Ford release are you referring to? The new Neroli Portofino Acqua especially, but there’s also a ludicrously-expensive Forte option. Four bottles?!? I’m impressed, it’s barely been out 2 years! Bought a 30ml the day it came out on the spot (! ), then went up to a 50ml, then a 90ml, and now I’m back to a 30ml. The circle of life! I’m rather glad that I managed to find a signature so early into my perfume journey, hehe. Nice!! I switch perfumes too much to go through that much of any one thing. The 30ml white bottle I have too and it’s just so nice to look at sitting on my dresser. I find this line so confusing! I got a sample of the one that LT liked. It would have been OK but for a note that reminded me of artificial cocoa mix. I don’t know which one that was, but agree the names are ridiculously confusing. 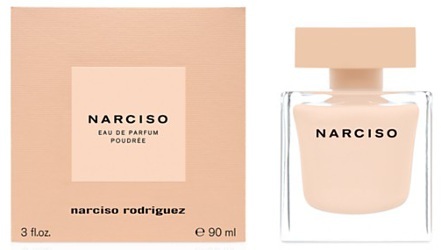 It’s hard to believe nobody at NR can figure out that having fragrances called “Narciso Rodriguez for Her” and “Narciso” (both followed by a string of flankers) might not be a great idea. perhaps that’s the idea : purchase a bottle that’s not the one you meant to get, like it a lot, and go back for the one you were originally supposed to buy, and hopefully like it too. i love the original edp and also found the edt too meh for words. very excited to test out this poudre version as i love powder too !! and love the delicate dusky pink colour ! the only other NR fragrance i used to wear was essence – the one in the silver bottle. I know people have raved about the original Narcisco Rodriguez fragrance. I am behind and need to try all of the NR line. I’m not a fan of powdery fragrances, but I will try it. I love, LOVE Narciso edp. I stopped myself from blind buying the edt, thanks to Robins review, reminding me I am not a fan of peony. Thanks Robin! I’m not a big powder fan, but I will definitely give this a try when I see it. I am still hoping they’ll do a flanker w/ the original’s gardenia! I tried it and love it, I just couldn’t stop smelling my wrist!!! Shame I found it too feminine for me although I normally I don’t mind it. I remember loving Love, Chloe so I guess I was an easy target. For sure it will be a gift for a girlfriend soon. There are lots of great powdery masculines, but agree there’s something about these cosmetic powder fragrances that really does skew feminine.